How sweet an echo it is! "The first effect is that of anguish...."
The first effect is that of anguish, of space, and of solitude. Secondly, the fragility of the wings of a butterfly, projecting long shadows of late afternoon, reverberates in the landscape like an echo. The feminine element, distant and isolated, forms a perfect triangle with the musical instrument and its other echo, the shell." 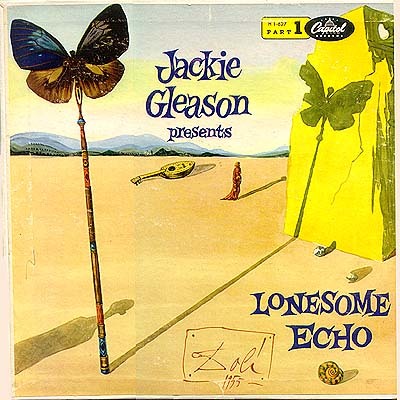 It's still for sale as a CD on Amazon.com (with the Dali cover, of course). 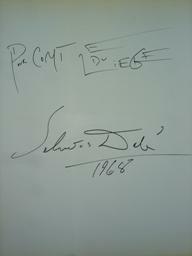 I've looked all over the Internet, as well as in my books, but there doesn't seem to have been any Comte du Liege for a long time, and there's no particular connection between Dali and that city, so I'm stumped. Female centaur victim of false labeling? I just scanned my woodblock print of Salvador Dali's depiction of Dante's Inferno, Canto 12. Commonly known to scholars and galleries as "The Minotaur," some revisionism is needed, because as anyone with a minimal knowledge of mythology can see, the image clearly shows a centaur -- and a female centaur at that. There's a male archer too who appears to have just shot an arrow, and while his involvement with the centaur is not exactly clear, she seems to be looking at him. In the background, another centaur holds a spear. As in the world they used the chase to follow. Come ye, who down the hillside are descending? Tell us from there; if not, I draw the bow." That will of thine was evermore so hasty." And for himself, himself did vengeance take. That other Pholus is, who was so wrathful. Out of the blood, more than his crime allots." As to the artist's own view, he seems to have been inspired by reading the text of Dante to come up with the images, but once he did the paintings he moved on to other things, leaving the publisher to come up with names. So collectors are stuck calling this poor girl "the Minotaur." 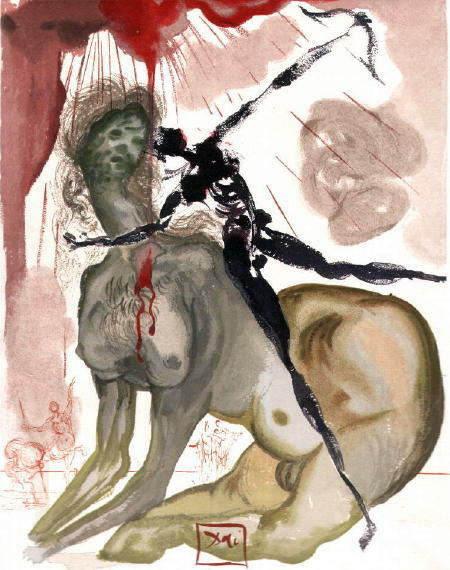 ADDITIONAL NOTE: The Minotaur has a man's body and a bull's head, and there is no such thing as a female bull, so unless Dali was anticipating postmodernist interpretation, I don't think the above can possibly be construed as a female Minotaur.